I've been waiting for this book. It arrived in the mail on Saturday and I promptly devoured it. I read The Looking Glass Wars earlier this year and thoroughly enjoyed it. I thought it was an imaginative twist on the original tale of Alice in Wonderland by Lewis Carroll. I cannot recommend The Looking Glass Wars more highly. Seeing Redd? Not so much. So here's my beef with Seeing Redd: it's cult-ish. By that I mean, The Looking Glass Wars was such a hit that Beddor created some graphic novels to tell the "before" story of Hatter. He is also writing a screen play. Which means that Seeing Redd is written more for the big screen than for the story. Or so it seems to me. I'm feeling very anti-Hollywood these days and I really don't feel like the book is trying to appeal more to the screen than to me, the reader. 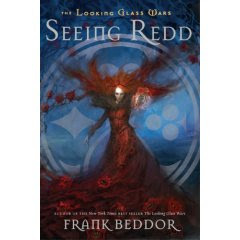 I would say that a 14 year old could be handed a copy of The Looking Glass Wars and be able to thoroughly enjoy it. I would not be as free with Seeing Redd, as Beddor wanted to discuss more adult relationships. There isn't anything explicit at all. Don't get me wrong. But come on. The hint, the explanations, bringing in background relationships did not contribute to the story. His main focus seems to be the survival of Wonderland and Queen Alyss. His introduction of some premarital relations do not contribute. For me, they detract. Also -- and this really ticked me off (don't worry this isn't a spoiler) the villain in this story seems to be a villain mostly because he's portrayed as a male chauvinist. It's like Beddor thought I'd hate the villain more because he made anti-feminist statements. What the . . . ?!?!?! Sorry but it didn't make me like or not like the villain anymore or any less. It was just an annoying side effect that had to be dealt with in order to hear about Wonderland. I'm really not impressed with Beddor and his half baked attempt to appeal to feminists (I mean the outright and very vocal ones). I like the story for the story. Stick to it, please, and I'm good. I'd like to avoid spoilers in this post, especially given the fact that this is a trilogy. I'm still interested in reading Part III of this story but Beddor is quickly loosing me by writing for the fame instead of for the quality. Big thumbs up on his original idea, thumbs down on the direction he seems to be going. I will read the third book and I will watch the movie, however, my excitement is starting to wane. I have heard much about the triology. Yet to read any. I think I will pick the first one. Then see if I like it or not. ONLY JUST NOW got "The Looking Glass Wars" and read it in three nights. You'll have to tell me whether you think it's worth continuing. I enjoyed the book, but my IN pile of books to read is so big I hesitate to put it off for another in this series. So what do you think... should I?